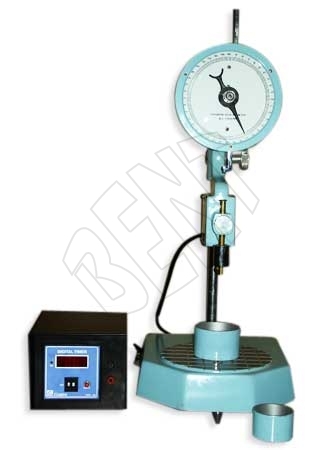 Bitumen Penetrometer or Standard Penetrometer is basically used for testing bitumen, tar, cement and soils. We are the leading Manufacturer and Supplier of Bitumen Penetrometer in Delhi (India). The Bitumen Penetrometer, supplied by us, is made from finest quality materials which provide excellent services to the users. Cast aluminum base with an iron stand on which moves an aluminum arm. A 15cm dial fixed on this arm and a brass rod sliding through the lower portion of the arm. A needle with weight fitted to the brass rod. The dial is graduated from 0-400 in one tenth millimeter sub division. We have an automatic model of the Bitumen Penetrometer supplied with a digital timer.